Home Travel Kerala – God’s Own Country! A tagline like “God’s Own Country” would, at first glance, seem pompous. With an incredible amount of scenic beauty including lush mountain jungles, lazy backwaters and thundering coastline, no one could doubt that Kerala is blessed enough by nature. But God? Well, here’s some background. St. Thomas, one of Jesus’ disciples, is said to have come here in 52 AD and established one of the many churches here. The first mosque Cheraman Juma was set up here in 629 AD by Arab traders who visited Kerala to trade in spices. This meant that both Christianity and Islam were part of Kerala’s cultural milieu since their very inceptions. Given that Kerala is also a well-established centre for Hinduism with its knowledge of Ayurveda and Yoga, a unique mixed culture emerged – the likes of which would be almost impossible to be find anywhere else. Apart from nature, even the Gods indeed seem to have blessed it. As the list below samples, once Kerala has been experienced personally, Kerala Tourism’s tagline might seem not pompous anymore. Yes, when we talk about the co-existence of different major religions for thousands of years, the first thing which comes to mind is festivals and in Kerala, there are many. The Aranmula Boat Race, held annually during the harvest festival of Onam, offers an opportunity to witness the stunning speed and co-ordination required to row snake boats as they skim the calm backwaters of Kerala. The elaborate Malayali (as residents of Kerala refer to themselves and their language) artform of Theyyam with its masked dancers and their colourful worlds is celebrated at the Kuttikol Bhagavathy Temple in an annual festival also named Theyyam. Puthuppally Perunnal (Malayali for “Puthupally Feast”) is another occasion to enjoy a festive colourful at the renowned St. George Orthodox Church, Puthupally. Since we talked only mostly about the humans so far, let’s not forget about the wonderful animal residents of Kerala and their homes. The Western Ghats mountain range runs from north to south through the entire length of the state creating the Nilgiri Biosphere Reserve, one of the most biodiverse ecosystems in the world, and a number of picturesque waterfalls & locations. The wildlife viewing pleasures are many and the boat safari through Periyar Tiger Reserve should give you ample opportunity to experience it. Tigers, elephants, bisons, leopards and as many as 265 species of birds await your curious eye. The Silent Valley National Park, another masterpiece by Mother Nature, is home to a vast variety of Western Ghats’ flora and fauna, some of which is found only here as the Kunthi river sprints through it via a deep gorge. The Kunthi, a wild and untamed river, never turns muddy at any time, always clear as glass. Any tour of Kerala is incomplete without sampling the many lagoons and lakes which feed into the Arabian Sea. Quaint and colourful fishing villages dot these vast spaces of green and calm. To experience them, glide through their world on a backwaters cruise. Alappuzha, often referred to as the Venice of the East, is a popular destination for a true backwaters experience. You can opt to stay overnight or many nights on a comfortable houseboat to make your backwaters experience even more memorable. 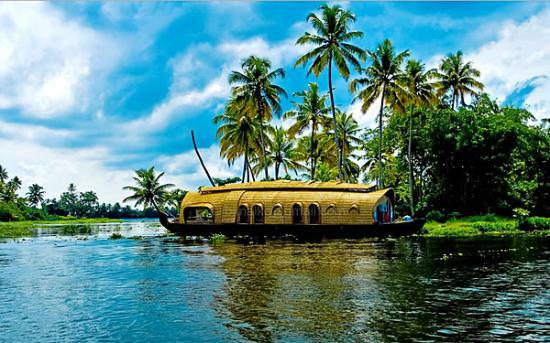 The Kerala tours package has options available for every budget and need. The long coastline shared by Kerala with the Arabian Sea means that it also has many pretty beaches. Kovalam and Varkala are the most well-known but there are many more options for the curious traveller in search of the sun & sea. Bekal Beach, with its old fort, offers a spectacular setting with some very appealing peace & quiet. The Cherai Beach is a 10 kilometer long beach which also had the added advantage of having many backwater lagoons in its vicinity, giving you the opportunity to experience the best of both worlds. There you have it. A quick cross-section of what God’s Own Country has to offer. Once there, you will realize, not only why it is named so but also that one trip might not be enough. With its eye soothing landscapes and its immense cultural variety, Kerala is one place which will keep calling you back. Previous articleThe Secrets of Sri Lanka Unfolded! Next article10 Beaches You Must Visit If You Are In Goa!